Probably Overthinking It: Secularization in America, part one. Freshman hordes more godless than ever! All of these are based on data from the Cooperative Institutional Research Program (CIRP) which runs the Freshman Survey, an annual survey of more than 200,000 incoming students at 270 colleges and universities in the U.S.
More recently, I read Secularization: In Defence of an Unfashionable Theory, by Steve Bruce. Bruce presents the "unfashionable theory" that as societies modernize, they secularize. In his formulation, modernization includes trends toward individualism, industrial capitalism, science and technology; and secularization means "decline in the social significance of religion." The poster child for secularization is Western Europe, where the social influence of religion has been in decline for centuries, and where in every country the fraction of people with no religious affiliation has been increasing for decades. But skeptics have suggested that countries where people are still religious, like the United States and many countries in the Middle East, are exceptions that disprove the theory. Bruce replies that religious countries in the Middle East are not exceptions because they are not modern, and the United States is not an exception because it is, in fact, secularizing. The data from the Freshman Survey are consistent with secularization. The number of incoming college students with no religious affiliation has been climbing consistently since 1978, and the number of students reporting participation in religious service has fallen at about the same rate. Of course, college students are not a random sample of the population; for that, we can use data from the General Social Survey (GSS), which is (according to the GSS) "widely regarded as the single best source of data on societal trends." It has run since 1972; each year (or every other year since 1994) it surveys a sample of about 2000 adults randomly sampled from the U.S. population. Respondents answer hundreds of questions about their background, life history, and beliefs. Many questions are repeated from year to year for trend analysis. Is there evidence of secularization in the U.S. (Hint: yes). Can we explain the causes? Can we predict how these trends will continue over the next few decades. 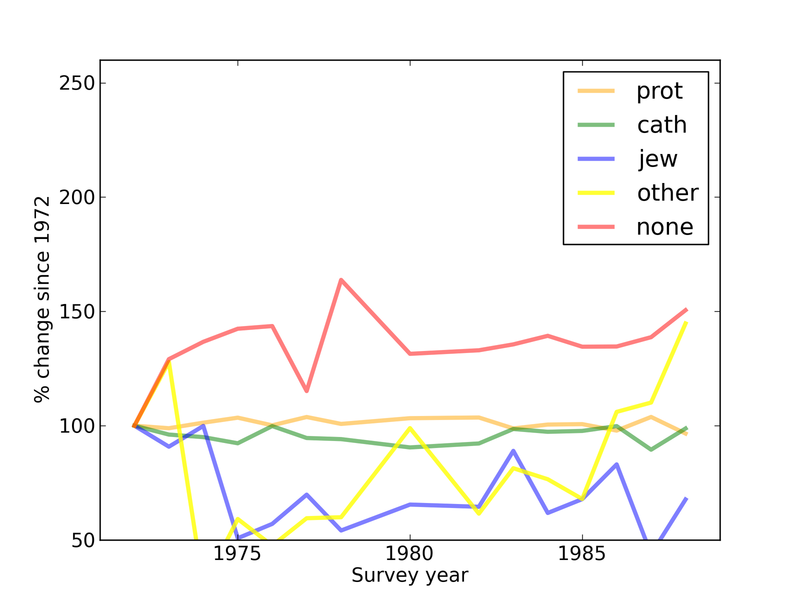 To get started, I tracked responses to the question, "What is your current religious preference?" The original set of options was Protestant, Catholic, Jewish, some other religion, or no religion. After 1994, the set of options was expanded, but for my purposes the original options are enough to describe large-scale trends. The following graph shows the fraction of the population in each group over time. 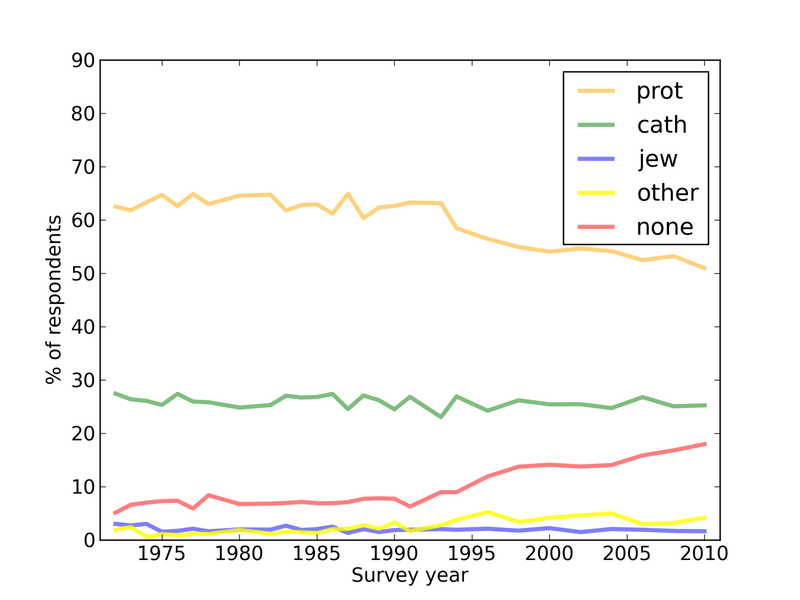 From 1972 to 1988, the fraction of Protestants and Catholics was unchanged, but the fraction of Nones may have increased. 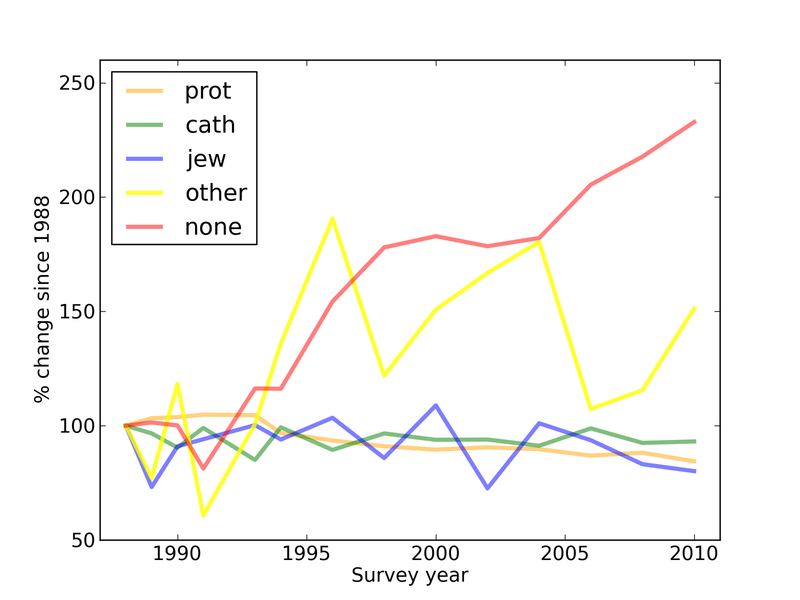 From 1988 to 2010 (the most recent survey year), the fraction of Protestants and Jews declined, and the fraction of Nones increased by almost 250%. The number of Others increased during both intervals, with more variability. 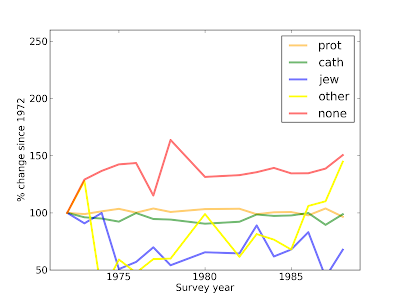 This dataset shows signs of secularization in the U.S., at least since 1972. 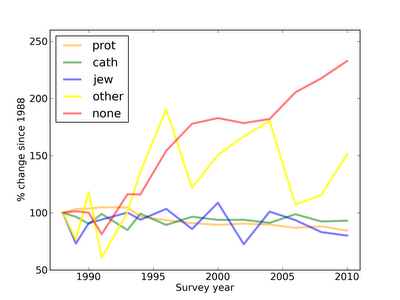 But religious affiliation is just one aspect of religious identity; there is a lot more data in the GSS to look at. My particular interest is in explaining the trends we have seen so far, and predicting what's coming next. It is tempting to think that something happened in 1988 to cause the inflections in these curves, but I think it is more likely that the origin of these changes goes back farther. To test that idea, let's pretend that it's 1988. We have see some changes in the market share of different religions since 1972, but nothing bigger than a few percentage points, and no indication of acceleration. Could we have predicted the much larger changes coming between 1988 and 2010? In the next few articles, I develop several models intended to answer that question. Then I turn to prediction: using the data up to 2010 (and 2012 when it is available) what can we expect in the next 20 years? Another trend you may be unaware of - some evangelical Christians increasingly refuse to identify as being in a denomination, and some even have dropped calling themselves "Christians" at all - rather, they're "followers of Jesus". I suspect this may impact such surveys. How much? Nobody knows - no one, to my knowledge, who conducts such surveys is even aware the trend exists. 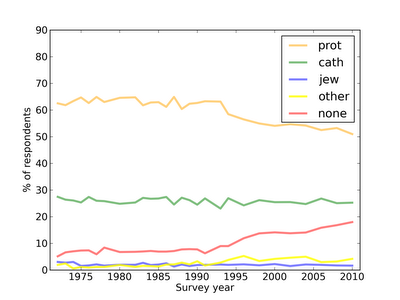 But the upshot is, the increase in the "other" category does not necessarily mean growing secularization. Hi Bruce. The nice folks at the GSS made some changes in 1994 to include more religions, including a generic "Christian." For my analysis, I am lumping Christian back in with Protestant, and all other religions into Other. The numbers are small enough that it doesn't make much of a difference. The trend you pointed out is interesting, but I suspect that people who prefer "follower of Jesus" will accept "Christian" if it is one of the options, or Other if they are particularly contentious. So no, I am not treating the increase in Other as a sign of secularization, just None. How much of the increase in "other" is due to immigration from, e.g., Asia, the Middle East? Between 1970 and 2010, the number of US residents born in Asia (including the Middle East) increased by about 4 million, or about 1% of the population. So that could account for at most 1 percentage point of change in the Other category. According to the first graph (which I would think would be the relevant one) "other" is now at about 3%, so a 1% influx might have had a significant impact over the past several decades, where the number has been bumping along at 1-3% of the total. Maybe I'm not reading the graph correctly, but it could account for as much as a 50% relative increase in "other" (from 2% to 3%), if I've read it right. Also, many of these immigrants are young and have children (and grandchildren, you are looking at a 40-year interval here). Yes, GSS questions include "Were you born in this country? ", "Were your parents born in this country?" and "How many of your grandparents were born in this country?" It really is an amazing dataset. So one could certainly dive deeper into this question (although I probably won't). As I recall, one of the major supposed driving forces in the secularization hypothesis is increasing economic security (presumably leading to reduced need for comfort drawn from intangible sources). It would be very interesting to see if the trends in the data you have correlate with changing wealth. If your data is broken down by state, for example, what are the slopes like when states are sorted by economic progress over the relevant period? Interesting. I am not sure the time scale of the GSS is right for answering this question -- I think the kind of security in this hypothesis is more like security of life and property. I don't think variations in regional economic performance would get at it.